The crisis du jour, outside of the eternal mess of the Middle East, is the arrival of thousands upon thousands of children on the doorstep of the United States. With bleak economic conditions and violence in their streets, central American families are giving their children up, sending them off to be abandoned at the border of the United States. Over fifty thousand children so far this year, which in and of itself is a mind boggling number. Our response, of course, is the usual. From some quarters, the usual ones, there have been calls for crackdowns. More border patrols! More security! Take the hard line! That appears to be the course we're on, but it's a problematic one. These are, of course, children, which makes the hard line just a tiny bit more difficult. Sure, poverty and desperation are being manipulated by those who profit from the transporting of the children. Rumor and mis-communication also haven't helped. But those things are immaterial to the reality at hand. If we take a hard line as a nation, turning a cold hard shoulder to children who arrive helpless on our doorstep, then we'll have crossed a line as a nation from "being concerned about our borders" to "being evil." It's a tricky wicket for those who prefer fulminating absolutism as their response of choice. What's hardest to grasp, though, is just why a parent would send a child off to a distant land alone. It isn't an act of calculation. It's an act of desperation. If you have children, you know just how hard such an action would be. How desperate would you need to be to take that action? To pack your child up, and send them off to the mercy of an unknown shore? How can we understand that level of desperation? How can we frame it, particularly those of us who draw from the long story of my faith? My own denomination has made earnest statements about the issue, both heartfelt and practical, although a little lacking in theology or clear grounding in our faith. And that ground is there, without question. One image seems to pop most cleanly for me from the great sacred story of scripture. A mother living under intolerable oppression casts her child away to an utterly uncertain future, abandoning them to fate, hoping against hope that they will survive. That child washes up at the feet of the powerful. The scriptural analogy seems so obvious. Am I the only one who sees this? Perhaps it's the scale of it that makes us miss it. 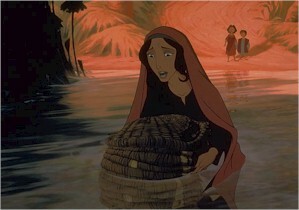 Fifty thousand Jocheveds, and the Nile running thick with baskets? What a strange and terrible age we must live in.